A $3 million Cardrona Skifield development that will create New Zealand’s only internationally sanctioned downhill course and open up 150ha of new slopes is near completion. The development includes a 35m-long tunnel linking a new trail to a ski-lift return station, a new chairlift that can carry 2400 people an hour and new trails that will add 300m of vertical skiing and snowboarding to the existing skifield. Up to 30 contractors have been working on the development since January. Cardrona Skifield field manager Gary Husband yesterday said work steadily progressed during summer which ensured completion later this month was assured. “By late this month we should be load testing the Valley View chairlift and getting it certified,” he said. The 150ha of new trails will open up slopes on the lower field for intermediate and advanced skiers and boarders, Mr Husband said. International Ski Federation technical delegate Nigel Brown yesterday confirmed the Cardrona downhill course would be the only one in Australaisa to hold federation certification. Cardrona Skifield general manager Duncan Veall yesterday said the developments had benefits other that creating 20 seasonal jobs for lift operators, ski patrollers and snow groomers. 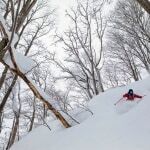 “It’s exciting to create more jobs, but super-G certification will be forthcoming, and we should also get World Cup certification, which will exciting for future events,” he said. The new lift capacity would help spread skiers and snowboarders more evenly around the mountain and will mean less waiting in queues Mr Veall said. Tens of thousands of cubic metres of earth had been shifted to form the supports surrounding the tunnel. The tunnel is 35m long, 8m wide and 5.5m high. More than 300 cubic metres of concrete was needed to build the tunnel. It would be used by skiers and snowboarders and was built large enough to allow large snow-grooming machines and snowmobiles access.